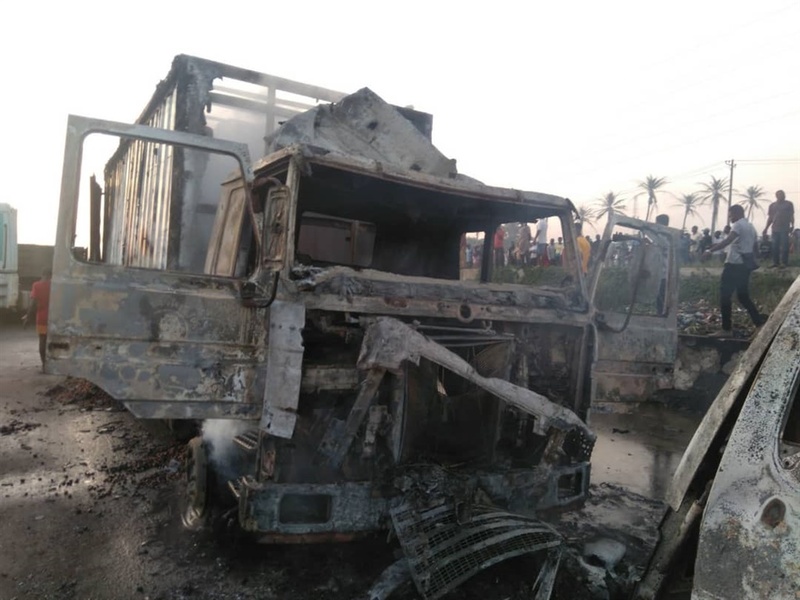 When the fire was eventually put out by men of the Fire Service, nine vehicles comprising four articulated vehicles, one truck and four mini buses were razed. The Nigerian Police has confirmed that nine vehicles were burnt in an early morning fire incidence that occurred at the Ojo Military Barracks, Lagos. Police say no life was lost in the fire, which started at midnight along Lagos-Badagry expressway. When the fire was eventually put out by men of the Fire Service, nine vehicles, comprising four articulated vehicles, one truck and four mini buses were razed. “No life was lost and there was no report that anyone was injured during the incident. It is worthy of note that no fuel tanker was in sight nor burnt as a result” Lagos Police PRO Chike Oti said in a statement made available to Bounce News. Meanwhile, the Commissioner of Police, Lagos State, CP Edgal Imohimi has directed the Disaster Management Unit of the Command to investigate the cause of the fire in collaboration with relevant agencies.